This is the second of a series of seven articles on professional service innovation. The objective of the series is to provide a basic introduction to innovation management for managers, partners and change agents working in professional service firms. This article helps answer the question ‘Where should we innovate?’ To read the first article in the series go here. A key question for a firm’s management team is where to focus its innovation efforts. Far too many firms take an unfocused, unstructured, ‘laissez faire’ approach, resulting in time and money being wasted in projects that have poor value, failing to invest in projects that have much higher potential value and spreading investment and resources too thinly across the firm on too many projects. As a business development director of a major UK law firm put it “In practice we can have a lot of ‘crappy’ projects going on.” To avoid such a wasteful situation, a firm needs to have a systematic approach to framing and then developing innovation opportunities followed by an objective way of evaluating and selecting the resulting proposals. I will tackle the first requirement in this article and the latter in the next article on establishing an innovation system. 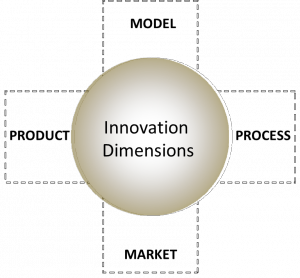 A useful model to help with this focus, based on academic research, is the ‘Dimensions of Innovation’ model. This models all the potential areas that an organisation can innovate in as four major ‘dimensions’ (see Figure 1). The centre of the circle represents the ‘Do Nothing’ state (i.e. no innovation). An organisation can then innovate in any number of the dimensions – the further out the circle is pushed, the higher the degree of innovation. Thus a small radius represents Do Better incremental innovation; the largest radius represents Do Different radical innovation. I have used model this with legal, insurance, engineering and consulting clients over the past decade and I have found it to be a very useful tool, as it provides a single page view of innovation possibilities within a business. This helps facilitate discussion around existing innovation activities and highlights future opportunity areas that have not been well explored. As such, this provides a useful structure against which existing and proposed innovation activity can be mapped and reviewed. This type of innovation lies in providing a new or enhanced value proposition to clients through the improvement of existing service products or the development of new services. 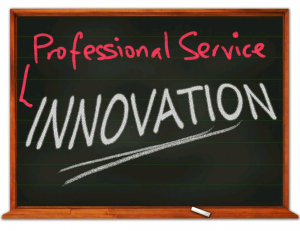 In professional services, this can come from efficiency improvement through process innovation – resulting in ‘Do Better’ innovation of an existing service – improving the client service experience or providing a lower priced offering. It can also come through client-focused innovation, which can result in a new or ‘Do Different’ service – for example a web-based offering or a new pricing model (e.g. fixed fee or risk-sharing). For many professional service sectors, clients increasingly want price certainty and fixed price offerings provide this but also enable firms to keep the benefits of cost reduced services as improved margin. Example: Mills & Reeve, a major UK law firm, facing significant pricing pressures in its inquest service from budget-constrained public sector clients, developed a web-enabled tailored inquest service for NHS clients offering a menu of pricing options including fixed fees. This new service utilized significant efficiency improvements and was adopted by a number of UK hospital trusts. Process innovation covers the application of new ways of performing work – this can be new methods, new skills, new technology (e.g. IT) or organizational changes. This innovation can be applied to internal administrative processes (such as Bid Management, Billing or Client Inception) or chargeable services (such as Due Diligence, Project Delivery, Accounting Audit or Claims Management). It uses analysis of existing ways of working and the application of improvement techniques, such as Lean, to redesign processes to reduce cost and rework, speed up the service and improve quality. Key improvement opportunities include the application of standard procedures and documents for repetitive work elements, IT applications such as workflow management and internal and external collaboration solutions and the ‘right-skilling’ of work tasks. This is a major opportunity area in most professional service firms, as processes typically are not well defined, standardized and have simply evolved over time. Employees typically have sufficient know-how to deliver a service but not know-why as to why it is performed in the way it is. This lack of insight is well captured by a manager in a major insurance company discussing current working methods: “A lot of what people are doing they don’t understand why, because it was done in the past.” So true insight is required to develop ‘Do Different’ process innovation – the innovation team need to ‘peel back’ existing services to their fundamentals and identify and challenge requirements and assumptions. There are a number of tools that can be used to help do this, (Codexx utilise a number of them in its Catalyst and Ideation workshops), one of the simplest is the ‘Five Whys?’ method developed in Toyota. In professional services, the line between product and process innovation is blurred, as the redesign of services typically will require process innovation. However some process innovation, such as in cost reduction, may be opaque to clients as there will be no change in the resulting service value or experience. Example: Allianz Insurance plc in the UK established weekly/bi-weekly team-based problem-solving to reduce cost and improve efficiency across their business and help to establish a more innovative working culture. This is where innovation occurs in the positioning of the firm in the market. This can be achieved by the firm entering an existing market in which the firm had not previously competed; establishing a new market, or by changing the nature of its competitive position in an existing market (for example by significant change in its price/value proposition). Example: The major international law firm DLA Piper, took advantage of UK deregulation of the legal market to launch a new legal vehicle LawVest. One of its first offerings was RiverView Law, a new business providing fixed price legal services, targeting small businesses and based on a lower cost legal organisation and defined processes. This enabled the firm to take advantage of market changes in a way that did not conflict with its existing ‘large client’ high-value brand. 3. The firm’s mechanisms for selecting and serving its clients. Business model innovation can be in any of these three areas. This is big, often ‘bet the firm’ innovation and is thus the rarest and most challenging type of business innovation. New entrants into existing markets often bring a new business model with them: RocketLawyer provides fixed fee legal ‘products’ via the web to small and mid-sized businesses; Crunch.co.uk provides web-based accounting services, also focusing on small and medium sized businesses; Freelancer.com provides an online market place to link over 16 million freelancers in IT and design services with customers. Example: In 1991 IBM made a strategic decision to become ‘a world-class services company’ moving away from its hardware focus. At that time less than 10% of its revenue was from non-maintenance services. By 2001, services accounted for 41% of revenue and this was more than 60% by 2011. This transformation in its business model required a 10 year journey involving changes in strategy, culture, resources, organization, processes and offerings. In the next article I will show how firms can establish a system for innovation that provides the key practices to support and direct innovation activities. Increasingly in organizations, ‘business as usual’, the amalgam of existing thinking, value propositions and ways of working is not enough. What delivered commercial success in the past is not going to do so in the future, for the competitive environment is becoming more challenging – customers and clients increasingly want more for less, new competitors are arriving and technological advancement offers new forms of competition. The result is that businesses are seeing the need for increased levels of innovation to effectively compete. 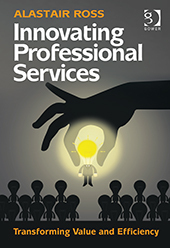 All the above is now also true for professional service firms, many of whom have been relatively insulated from such commercial pressures due to their high-value offerings which were not easily replicated or automated and for some professions, such as law, enjoyed regulatory barriers to entry. But this is changing and innovation is moving up the agenda for management teams in these firms. This creates a major challenge for many firms with limited experience or capabilities in effective innovation. Price-down pressures from clients seeking to reduce their supplier spend. Deregulation (such as in the UK and Australian legal sectors) enabling new market entrants. Service commoditization through the application of standardisation and IT. In response to these challenges, progressive firms are recognizing the need to innovate the services they provide and their ways of working. Such innovation enables them to reduce costs through more effective and efficient working and increases the value they provide to clients through new and enhanced services. It’s important to have a clear view of innovation to help in developing the most effective approach to enabling and managing it. Defining innovation can become an almost religious debate for innovation consultants, who often end up excluding ‘normal’ business improvement activities. In my view, a more inclusive definition is of most use when seeking to manage innovation programmes within businesses. With this in mind I find the most effective definition is: ‘Innovation delivers value from ideas’. This definition includes small and large innovations and those conceived in your own business as well as those copied from others, i.e. that is new to you. To consider that innovation is only about ‘radical new ideas’ would lead to incremental improvements receiving insufficient focus within the business – and high engagement incremental improvement is very powerful (just ask Toyota who have built their business success on their Lean business model driving continuous improvement with high engagement of their workforce). A view that innovation only covers things that are ‘new to the world’ would drastically diminish the powerful benefits of adopting best practice methods proven elsewhere (aka ‘copy with pride’). So innovation is about creating or using an idea and generating value from it (e.g. increased profitability). Successful exploitation of an idea is a key requirement for innovation. This is why innovation is more than just creativity – for many new ideas and inventions fail to deliver value and thus cannot be considered innovative. In the journey to realizing value from ideas, activities such as idea exploration, selection, development, implementation and learning are as important as creativity. And thus successful innovation within your firm needs the developers, the project managers and the trainers as much as the idea generators…. In developing effective innovation within a firm it is vital to differentiate between ‘individual innovation’ and ‘institutional Innovation’. Many business professionals would claim that they innovate regularly in their work, in their methods or in what they deliver to clients. However, this type of innovation is primarily individual innovation. Such ‘innovation’ is personal, it is not codified or easily scalable (it may not even be valuable) across the wider organisation. Therefore the impact of such individual innovation is very limited in comparison to institutional innovation. Institutional innovation engages other personnel within the firm and outside it through codified, scaled and deployed innovations such as new or enhanced services, new ways of working and new strategies that deliver increased value. Institutional innovation may well start as individual innovation, but the lone innovator creates something that can be used by others and not just themselves, something that can be developed and deployed into an institutional innovation. For a firm to be effective in using innovation to improve its competitiveness, it must master institutional innovation. And in addition it must establish a systematic approach to effectively manage its innovation activities. Where should we focus our innovation activities? What’s slowing or preventing innovation today? How do we select the best ideas, develop and implement them? How do we resource innovation? How do we encourage and reward participation? I intend to guide readers in answering these questions in this series of articles. In the next article I will show how firms can identify key opportunity areas for innovation in their firm by considering their key ‘dimensions for innovation’ and give examples of this in multiple professional service sectors. You are currently browsing the Codexx blog archives for September, 2015.